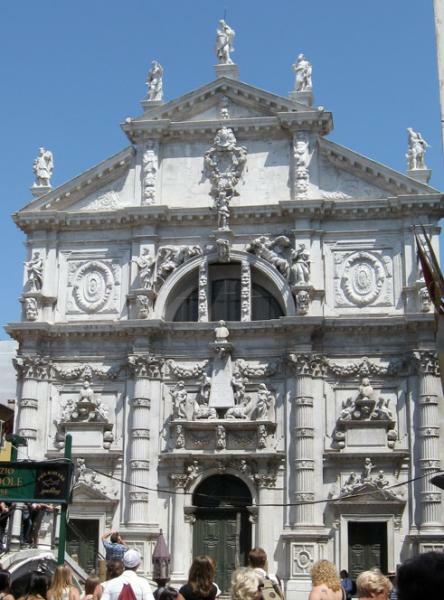 Venetians who regularly have to pass the façade of San Moisè (1632-68) have developed a self-willed blind spot for what might be Italy’s silliest church. The original church here was built in wood in 797 and dedicated to San Vittore. The second was built in 947 by Moisè Venier and dedicated to his namesake, 'Saint' Moses. Blame Alessandro Tremignon and sculptor Heinrich Meyring for the current building, but not too much: at the time of construction their grotesqueries fitted well into surroundings that included the state casino, or Ridotto, where nearly all the players wore masks, and the Teatro San Moisè (demolished in 1876), which opened in 1639 with the première of Monteverdi’s opera Arianna. Besides the facade, Meyring is also responsible for the extraordinary high altar rock pile, representing St Moses on Mount Sinai. But also, look in the sacristy for the elegant bronze altar of the Dead Christ and Angels (1633), by Nicolò and Sebastiano Roccatagliata, Pietro Liberi's altarpiece, St Helen Finding the Cross (a work generally believed to be his finest), and over the left door for the leering skeletons on the Hallowe’en tomb of one Canon Ivanovich. If the question ever comes up in a pub quiz: where did the great Scottish financier John Law (1671–1729) end up after killing a man in a duel in London and fleeing to France, where he single-handedly blew up the national economy when the bubble burst on his Mississippi Scheme? The answer to this teaser lies toes-up under the floor of San Moisè, after spending his last years in Venice living by gambling at the Ridotto. There’s an inscription on a slab near the entrance. Behind San Moisè and to the left is the Frezzeria, Venice’s now scarcely noticeable red light district. A right on Calle del Selvadego leads to the Bacino Orseolo, always filled with gently bobbing gondolas.